A black man (Sidney Poitier, To Sir With Love) develops a friendship with a blind white girl (Elizabeth Hartman, The Beguiled) he meets at a park. She doesn’t realize that he is black, and when her racist mother (Shelley Winters, A Place in the Sun) finds out about this friendship, chaos ensures. A Patch of Blue was written and directed by Guy Green (The Mark and A Walk in the Spring Rain), based upon the novel Be Ready With Bells and Drums by Elizabeth Kata. The film was made at the peak of Poitier’s popularity, and it was a big hit mainly because of his presence in the movie. Good reviews and positive word of mouth also helped this film become one of the biggest hit of 1965. I have always been fond of A Patch of Blue, but I must admit I was a little weary about revisiting this favorite old classic of mine. Usually sweet film memories are just that — sugar-coated remembrances of a movie experience. As you get older, your taste in movies change, and I was afraid that the film’s fundamentally simple structure wouldn’t appeal to me anymore. 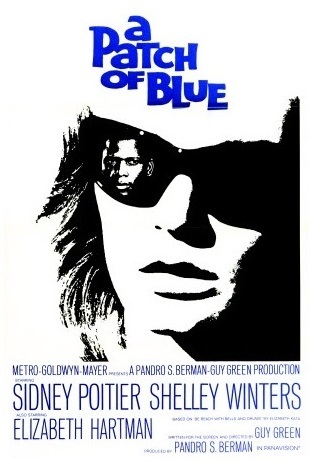 After viewing the movie again, I was very pleased to find out that not only has A Patch of Blue stood the test of time, but also its artistic attributes are as persuasive as ever. It is indeed an enjoyable film, full of heart-wrenching and sincere moments. A Patch of Blue‘s obvious central idea is the problem of racial barriers within American society, but don’t cringe — this is not one of those films that pushes the idea of racial equality down the viewer’s throat in an abrasive manner. Far from becoming preachy, the movie makes its case in a disarmingly natural way. Today this is a “problem movie” with no problem. A Patch of Blue has lost its power to shock, and that’s a good thing. The idea of an educated black man mentoring an uneducated white girl is no longer daring, nor is the fact that in one scene Poitier has the “temerity” to hit Winters (a precursor to the now famous slapping scene in the classic thriller In The Heat of the Night). When seen in the context of the 1960s civil rights movement, however, the film’s brave stand against the status quo becomes clearer. And that’s the great thing about watching older films — you can literally see how society has evolved over the years. The excellent performances of Poitier and newcomer Hartman help a great deal. Winters (she won the Oscar) is very good too. Also starring Wallace Ford (Blood on the Sun) as Ole Pa, Ivan Dixon (Porgy and Bess) as Mark Ralfe, and Elisabeth Fraser (Two for the Seesaw) as Sadie. Nice music score by Jerry Goldsmith (Alien and Star Trek: The Motion Picture). Shot in beautiful b/w by Robert Burks (Vertigo and North by Northwest). Although some key plot elements don’t carry as much weight as they used to, A Patch of Blue is still a very engaging drama. This is essentially a simple and well-told story about people trying to overcome the limitations of their environment. Race relations is an important element of the story, but the movie is more than that – it is, among other things, a story about love, friendship, and self-discovery. It also may be seen as a poignant coming-of-age story. B&W, 105 minutes, Not Rated. Golly! It’s forever since I last watched this — many thanks for the reminder. I must dig it out and give it another airing. Hope you enjoy the re-watch!